~ FOR INSTANT BOOK AND GENERAL BOOKINGS, WE WILL ACCEPT RESERVATIONS THAT ARE AT LEAST 5 BUSINESS DAYS AHEAD OF YOUR BOOKING. Find videos on the Net of Robina House Short Term Rental. Welcome to Corso Italia! This trendy area is Italian, Portuguese and Caribbean--This house is the biggest house on the block! A designer styled home, recently renovated, including wrought iron styled front double doors, French doors that welcome a 25 foot long balcony--great for "throw your feet up and grab your favourite drink" relaxation while people watching, chatting and laughing with your family and friends! Inviting dark, warm, tranquil coloured hardwood floors, welcome 3 bedrooms (queen, double, twin), that sleeps 5 possibly 6 (inquire). The kitchen and bathroom have granite counter tops, and porcelain floors. The kitchen is equipped with convenient stainless steel appliances--included are: dishwasher, Keurig coffee maker, kettle and toaster. Your own laundry and FREE coveted Toronto parking separates this apartment from all others!!! This is a pristine suite you must check out—well, check-in would be preferable. Create long lasting memories at Robina House...(Yes the photos are really our home). A 25 foot balcony ideal for people watching and just hanging out with your favourite drink. This is a quiet place to stay. only. (Sorry--just tea cup dogs and de-clawed cats). Wi-Fi. Perfectly suited for the business person or the mature family that needs peace and quiet. We are located near all amenities you can think of. Downtown is only 10 minutes away. Kensington market is about 8 minutes away. U of T Campus only about a 8-10 minute drive. York University is only about a 18-20 minute drive. Canada's Wonderland - (Canada's premier amusement park) and the huge Vaughn outlet mall is about a 25 minute drive—FUN, FUN!! Children: This is a QUIET place to stay for everyone. Due to tenants below, this home is not suitable for temper-mental dogs or loud children/toddlers/infants. Parties: Our home is not an ideal house for parties. Looking forward to hosting you at our happy home! Blessings, Sandy! I am a former professional basketball player. I travelled to many countries during my basketball career--met many fascinating people. I have 2 fantastic kids! One child is into sports the other one is on his way to becoming a master chef at 14 years old--his journey beginning officially at 6! You may have seen him on TV cooking up a storm! The neighbourhood is mostly quiet. There are countless amenities that are walking distance--library (they have computers with free Wi-Fi for the kids), bakery, restaurants (featured on Triple D with Guy Fieri), grocery shopping, upscale malls (Yorkdale) We are also close by to: Shopping Malls, Kensington Market, Sick Kids Hospital, U of T, Eaton Centre, George Brown College, China Town, Downtown Toronto, Ontario Place, CN Tower, Ripley's Aquarium and so much more! We love our home because of the 25 foot balcony great for people watching and kicking up your feet after a long fun day--We enjoy how very bright the 18 ft french doors brightens up our main floor. We also enjoy the granite stairwell and the regal iron/glass front doors that also brighten up the hallway. In the summer you will find more than 30 roses growing out at the front garden. Downtown is only a 15 minute drive south. There Is A Grocery Store About A 8-10 Min Walk Away Plus A Dollar Store, A Liquor Store, A Couple Of Banks, Cafe's And Restaurants, Hair Salons, Dry Cleaners, Drug Store...anything You Can Think Of...oh Ya...downtown Toronto Is About A 10 Minute Car Ride Or Jump On The Ttc Just Steps Away. This was a wonderful place to stay for a few days while attending a conference. Quiet, clean and comfortable with diverse restaurant options only a couple of blocks away. Hosts made sure we were comfortable. Arrangements were easy. Highly recommend. The difference between the posted description of this property and its actual state was beyond belief. 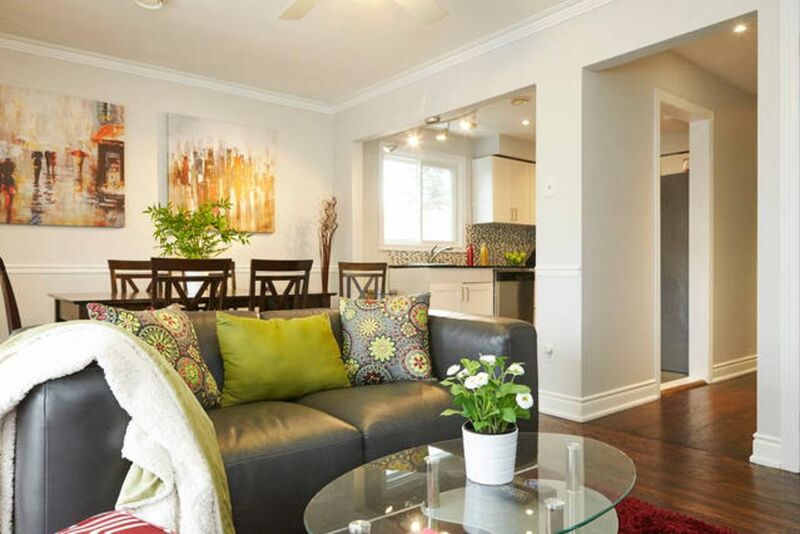 The property is not 8-10 minutes from downtown locations such as the University of Toronto or Kensington Market, but at least 25 minutes by any means. None of the descriptions of the property as “luxurious,” "upscale" – or even passable – were accurate. There was no thermostat for tenants to regulate the temperature, though it was advertised as having both air conditioning and heating. The size of the property was much smaller than advertised (no more than three could sit in the living room advertised for 5 or 6). Many appliances were faulty, non-functioning or dangerous (including the stove, dryer, toaster, bathroom fan, and smoke alarm), the “deep Jacuzzi tub” was shallow and mouldy, several power outlets were faulty, causing an interruption in the internet, and the apartment was dirty on arrival despite our payment of a cleaning fee. The owner, Sandy, did respond quickly to some of our requests to repair or replace faulty appliances. But then she turned around and accused us of breaking them. For example, I was accused of breaking the smoke alarm when I opened the cap to see what was wrong with it (I assumed a dead battery). Why would I have opened the cap if it was not already malfunctioning? We were also accused of disrupting internet reception until the service could be renewed, and of breaking a computer table that was broken to begin with. Sandy was dishonest or manipulative in other ways, for example telling us that we (the tenants) had no choice as to the day and time service men must arrive to replace the stove. Without our consent she had them arrive at 7 AM on a day that was completely unsuitable (important meetings for my wife and me that morning). Perhaps most disturbing was Sandy's assurance that the house had good sound insulation between floors. We have two very well-behaved 12-year-old twins, but were repeatedly asked to keep them quiet. And we went to bed most nights to the sound of the resident below us coughing, sneezing, or snoring. We left the property and rented another apartment one month and two days after arriving. Sandy refused to negotiate even a partial refund, despite polite and repeated requests, so we had to pay three months of rent for the period in which we no longer resided in the apartment. Altogether a frustrating and depressing experience. A few weeks into his 3 months stay he discovered he was able to get a family/friend’s home for free. That’s when the “issues” started to occur. He was well aware of the cancellation policy. He then proceeded to continuously complain and fabricate the truth hoping to get a refund. He demanded his money back which included continuous threats! I suggested he go through HomeAway. He did. He did not receive the answer he desired. The threats continued. I went over and beyond to help his family including offering to go to his kids’ school to start the registration process, which he stated he was very anxious and frantic about. He decided to register his kids for private school. He boasted that their uniforms costed $900 and tuition was $15K for 3 months. I wish him and his family blessings for the new year. Great place, close to a restaurants, shops. Very quiet, clean. Beautiful, relaxing balcony. Close from bus stops or subway. Great place to stay in Toronto, beautiful city with nice people and wonderful places and food. Sandy and her mom very friendly, great hosts. I can’t wait to come back to Toronto and stay in Robina House. Our stay at Sandy's place was absolutely perfect! We had everything to make our stay enjoyable and memorable. The easy access to everywhere in Toronto makes it a perfect location! Roxanne, we are happy you were able to navigate easily around Toronto! Thanks so much for staying with us! You are welcomed anytime! We fully support the 5 stars reviews of previous renters. We found the apartment exactly as described on the website. It was well equipped and kept and spotlessly clean. Sandy made us feel at home right from our arrival. We enjoyed the tranquility of the neighborhood and yet the apartment is within easy reach by public transport of downtown Toronto. Nothing to complain about. Thanks so much for staying with us! We hope that the many amenities around the neighbourhood, and our informative binder were helpful for your happy stay as well! Hopefully you and your family got a chance to eat, relax and stretch out on our balcony! Wonderful property close to downtown. Loved the outside patio. Cute and quiet neighbourhood. Would return. Thanks Meredith, your family was very sweet and respectful. Hope to see you all again. You can always plan to be here at Caribanna, Toronto Film Festival, The Jazz Festival and so much more in the future! Thanks so much for choosing us!! We are located near all amenities you can think of. Downtown is only 15 minutes away. Kensington market is about 10 minutes away. U of T Campus only about a 8-10 minute drive away. Canada’s Wonderland - (amusement park) is about a 25 minute drive. Rates are subject to change until reservation is confirmed. Please inquire if you want to bring a pet. Pets MAY be allowed in premises at owners discretion. A photo may be requested. A non-refundable pet fee will be added. If you have a change in your travel plans please let us know 2 weeks before you are booked to avoid any charges.